If, after a few visits, you feel at home here and would like to become more deeply engaged, the next step is to attend a New UU Workshop. New UU Workshops, offered once or twice a year, are fun events (food and drink are served!) during which you to get to know other people who are also relatively new to AUUF, and to hear from some AUUF members about why they came to AUUF and what keeps them coming back. Our minister will tell you about Unitarian Universalism and the AUUF President and Treasurer will explain how our Fellowship is governed and sustained financially. If you feel that AUUF is right for you, we hope you will want to become a member. Only members can vote in congregational meetings and be eligible for elective office. To join AUUF, you must first either attend a New UU Workshop or meet with our minister, and then simply sign the membership book. 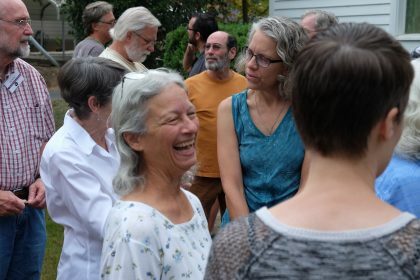 Fellowships and churches that belong to the Unitarian Universalist Association are autonomous organizations, democratically governed, and sustained by the financial contributions of members and friends. So, our members are asked to contribute their time and talents to the Fellowship and to make a financial contribution in an amount determined by the member. For more information about membership, contact our Membership Committee Chair at membership@auuf.net.